Vitalant exists to help people realize their life-transforming potential by offering convenient blood donation opportunities and sharing our expertise in transfusion medicine. 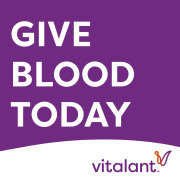 Founded in 1943, Vitalant is one of the nation’s oldest and largest nonprofit transfusion medicine organizations. Would you recommend Vitalant Colorado?